The 30+ Club is unique at all eight of our high schools. In order to be a member, a student must have a composite score of 30 or more on their ACT. 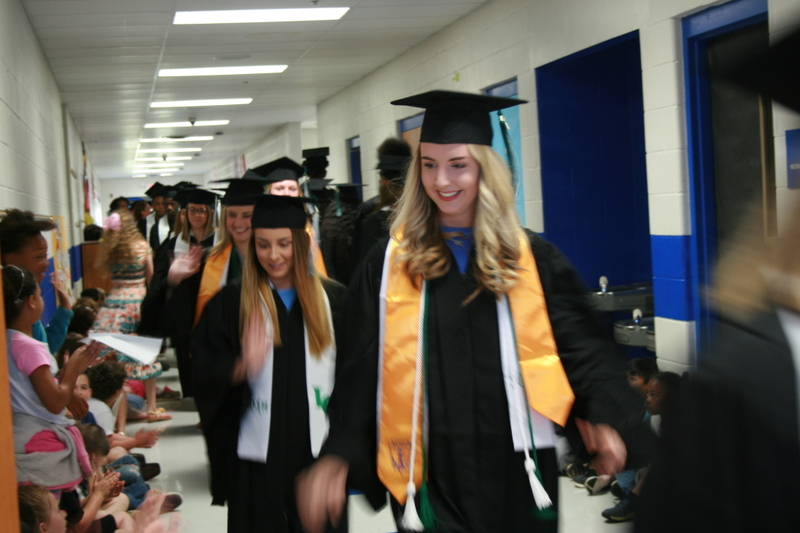 Our school district has a total of 136 seniors in the 30+ Club, and they were recognized by the DeSoto County Board of Education for this major accomplishment. While not all could be present for this special recognition, their names were called and their hard work was acknowledged. 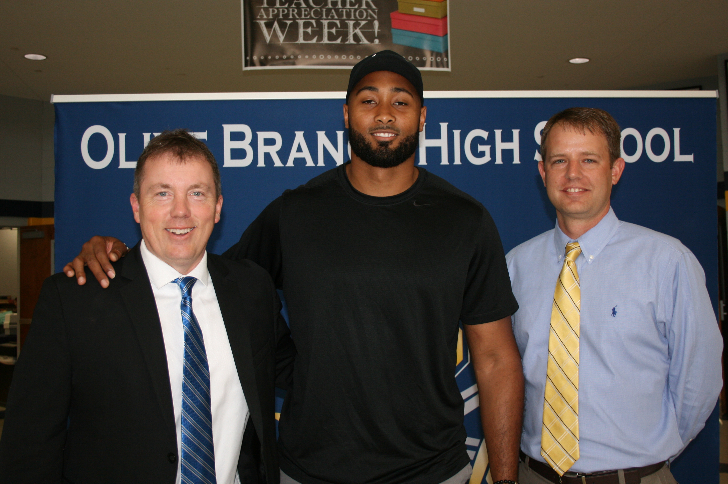 It is not every day a Super Bowl star comes to visit a DeSoto County School. 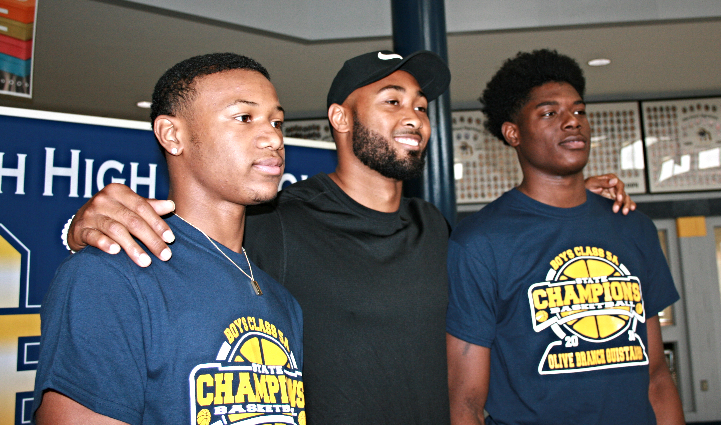 KJ Wright, NFL player for the Seattle Seahawks and starting linebacker in Super Bowl 50, flew home to return to his Alma Mater, Olive Branch High School. 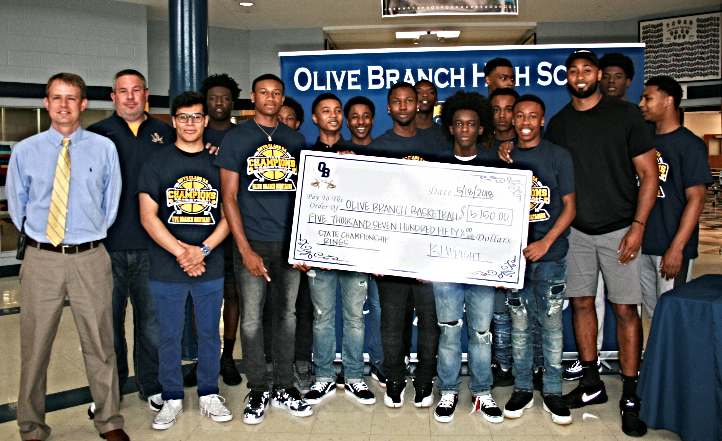 He met with the OBHS boys' basketball players and made a donation to pay for their 2018 state championship rings. In a brief ceremony, Principal Jacob Stripling thanked Wright for his generous donation, and former teachers reminded everyone that Wright was a strong student at OBHS and a leader in the classroom. Wright started kindergarten at Olive Branch Elementary and graduated from OBHS in 2007. He was a 3-sport athlete in basketball, track and football at OBHS, and his childhood home is a few blocks from the high school where his parents still live. After high school, Wright had a stellar college career at Mississippi State University. "I wanted to give back to my high school and my community. I am blessed to play for the NFL. This is a small contribution, " KJ Wright said. 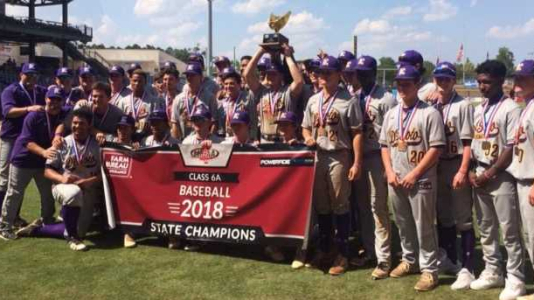 DeSoto Central's baseball team defeated George County in a three game series to become the 2018 MHSAA 6A State Baseball Champions. Game 1: George County 5, DeSoto Central 4; Game 2: DeSoto Central 5, George County 1; Game 3: DeSoto Central 10, George County 1. DCHS Head Coach Mark Monaghan was named 6A Baseball Coach of the Year. This was Coach Hicks' third time to make it to a state championship round, and the third time was a charm. The Jags defeated four opponents in the playoffs to win the state championship. 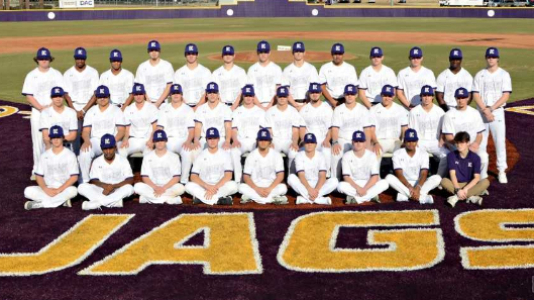 They defeated Madison Central, Clinton and Northwest Rankin to make it to the championship series. They defeated Harrison Central in two straight games to win the title. “All of the teams had different strengths. Each team brought a challenge. 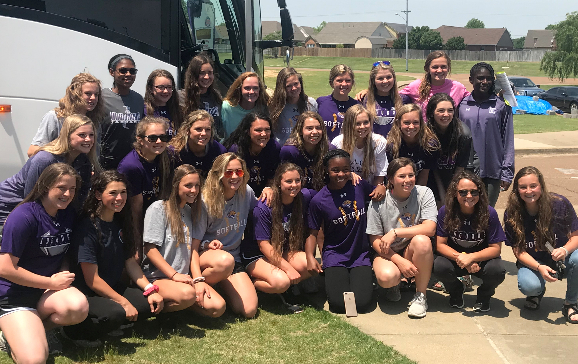 Our team is talented and combined experience with that talent—especially pitching—to win the state championship,” Coach Hicks said. Besides being great players, these girls are community oriented and are involved in their school, clubs and the community. “DCHS’s Most Beautiful and 1st Alternate are our pitcher and our catcher,” Hicks said. These two are good examples of our well-rounded team. “These girls have worked hard. They know they are standing on the shoulders of those before them,” she added. 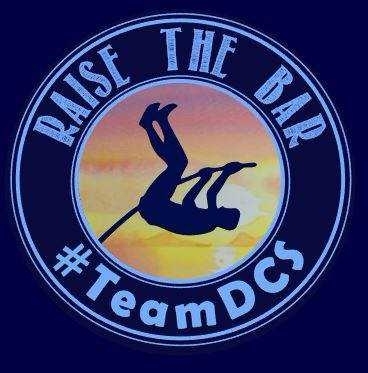 “They wanted to do something other DCHS softball teams have not. They wanted to win a state championship.” Since most players will be returning next year, Coach Hicks feels their future is as bright as ever. Even though this was the first state championship for Hicks as a coach, this was not her first state championship for DeSoto County Schools. She won two state championships as a Southaven High School player in 1997 and 1998 under late SHS softball coach Morris Hunter. Center Hill High School Girls’ Track team is the Mississippi High School Athletics Association 2018 5A State Champion Winner. Impressive? Yes. What is more impressive is that these young women started working for this title at a track camp when they were in the 4th grade under the direction of their PE teacher and coach, J.J. Downs. The original camp began with 10 to 12 students ten years ago. The coach's comprehensive track camp now has 50 to 70 students, and his high school track team has 100 students, about 50 girls and 50 boys. 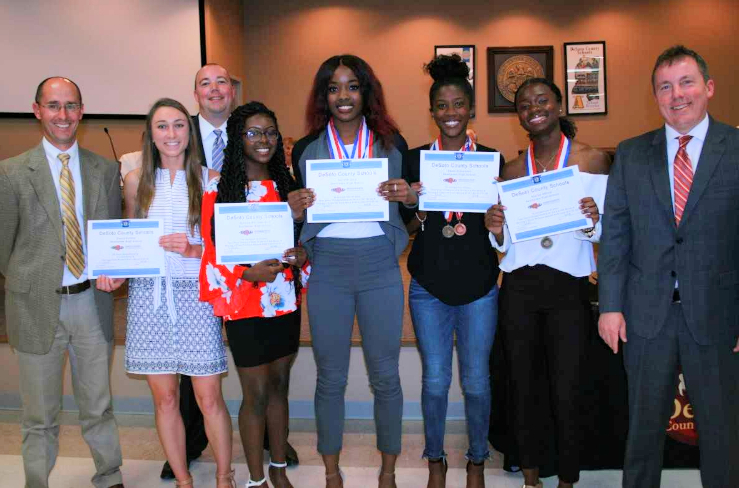 Nineteen of his Girls’ Track Team qualified for state, and they “brought home the gold” this year. Camaryn McClelland, a senior, won four events at the meet, with each event earning points for her team. Camaryn will attend Austin Peay University on a track scholarship in the fall. 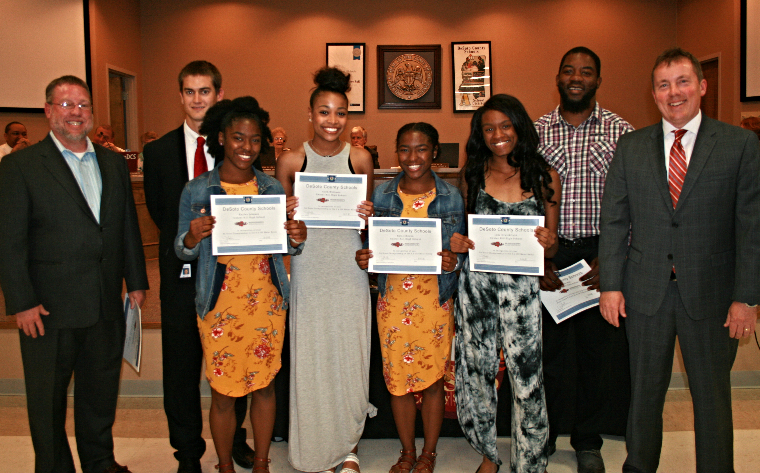 Southaven High School 4x400 State Relay Champions in 6A are Eboni Stevenson, Aaliyah Lacy, Shelby Olford and Kelaiah Williams Ball. The relay team set a new state record time of 3:57.52. They are pictured with Coach Jarrod Dudley, Coach Amy McCrory, Principal Shane Jones and Superintendent Cory Uselton. Olive Branch High School Student Athlete Ethienne Smith (center) is the 5A Long Jump State Champion. Principal Jacob Stripling joined Superintendent Uselton in congratulating the new champion. Olive Branch High School's Fabian Lovett (center) is the 5A Shot Put State Champion. 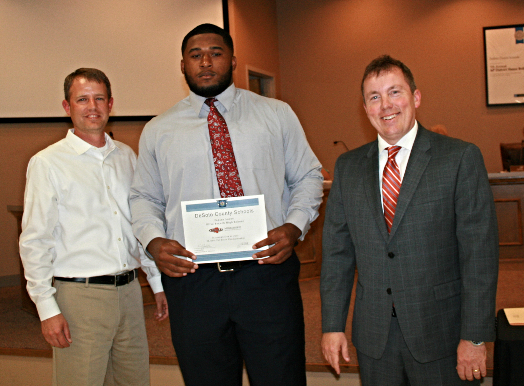 Lovett is pictured with Principal Jacob Stripling and Superintendent Uselton. Principal Duane Case joins Superintendent Cory Uselton to celebrate 6A State Champion Kaitlyn Cartwright who won the 800, 1600 and 3200 for Hernando High School. 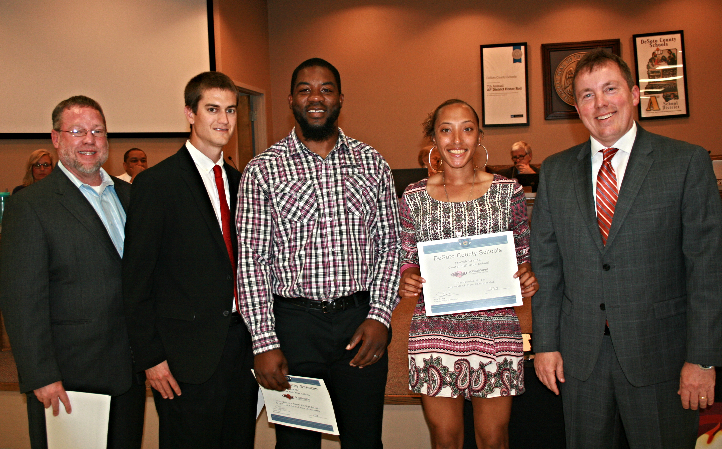 Kaitlyn and Coach Walker received certificates from the School Board. 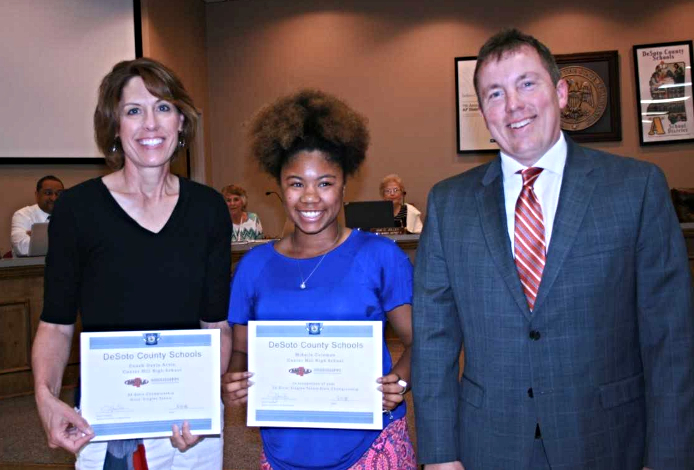 Superintendent Cory Uselton presented certificates to 5A State Tennis Champion Mikaila Coleman (Center Hill High School) and Coach Gayla Arvin. 5A State Champions in the 4x100 Relay are Kaylen Johnson, Jada Crutchfield, Faith Williams and Kyla Johnson. Coach J.J. Downs, Coach Epting and Coach Hall are pictured with the relay team and Superintendent Uselton. 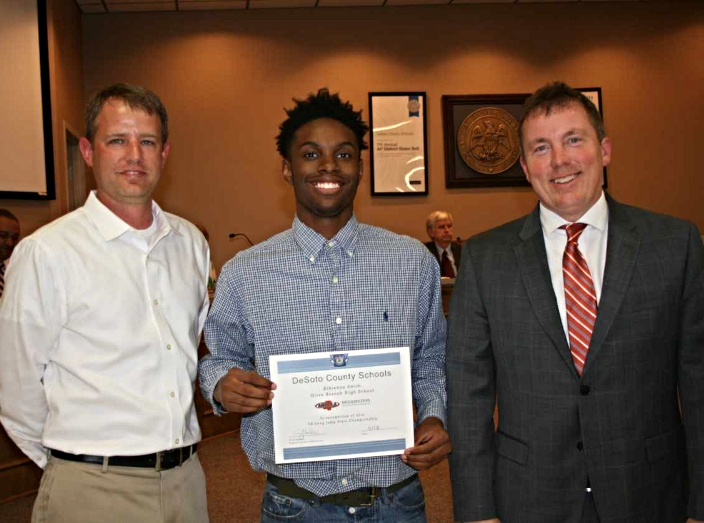 Superintendent Uselton congratulates Center Hill High School Student Athlete Jamyah Graham on the 5A State Championship in Pole Vault. Jamyah is surrounded by her coaches. Center Hill High School Senior Camaryn McClelland made it to the podium in four events at the State Track and Field Meet. She is the 5A State Champ in 100m hurdles, 300m hurdles, long jump and triple jump. 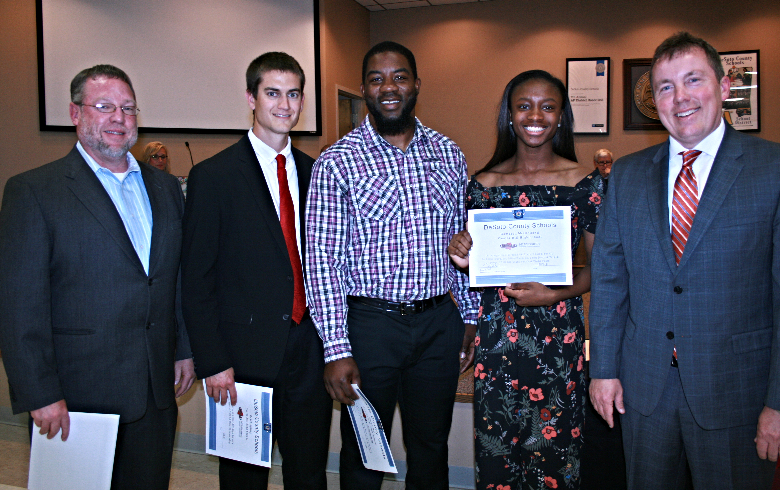 She is pictured with her track coaches and Superintendent Cory Uselton. 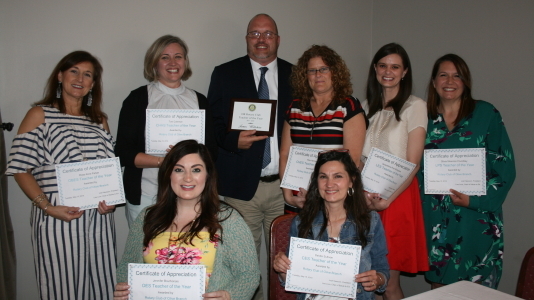 The Rotary Club of Olive Branch saluted education in a big way through three scholarships, Rotary Teacher of the Year presentations, recognizing a principal as a Paul Harris Fellow, and the announcement of a project to build a basketball facility at Center Hill Elementary School. 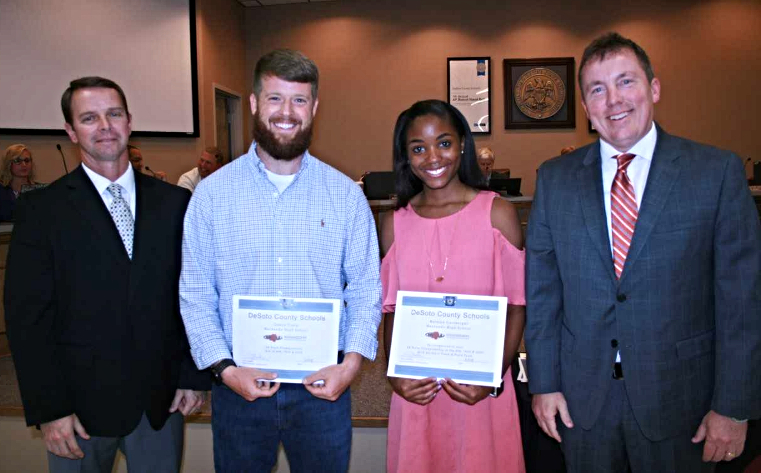 Three high school seniors, Amber Terry of Center Hill High School, Donovan Gordon of Lewisburg High School and Allen Bailey Saffold of Olive Branch High School, received $1000 scholarships for college. 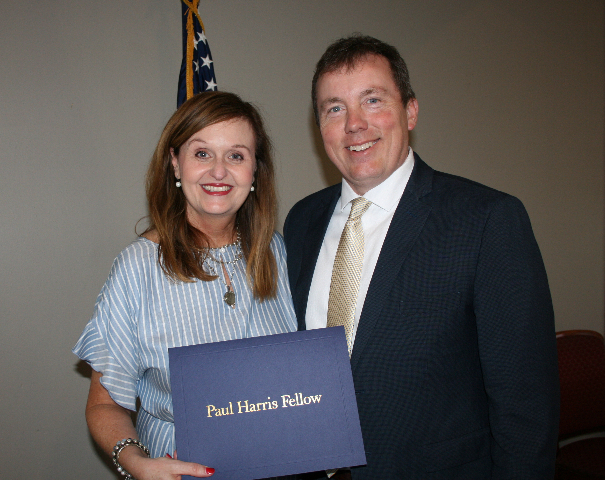 Lisa Love, Rotarian and retiring principal of Overpark Elementary, was named a “Paul Harris Fellow,” one of Rotary’s highest awards for her service to her school and her community. 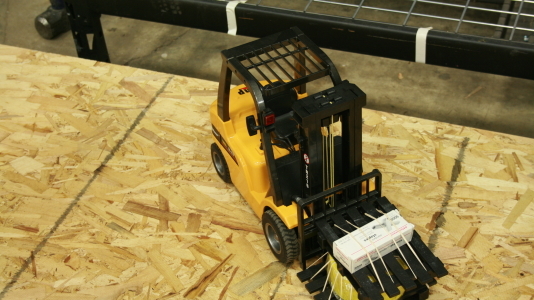 A scale-model distribution center with radio-controlled forklifts, automation and drone technology is on the drawing board for the Logistics Class at Career & Technology Center--East. 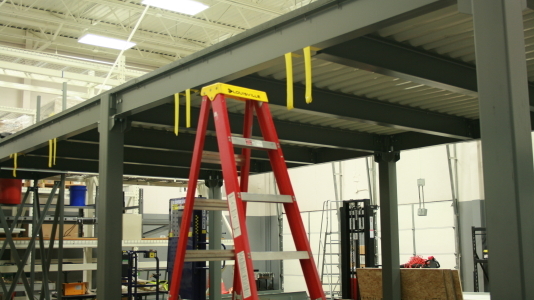 After securing a $14,000 grant from First Books to build a storage mezzanine, instructor Mike Doss decided this raised platform would be the perfect start to comply with the activity component of his logistics curriculum. 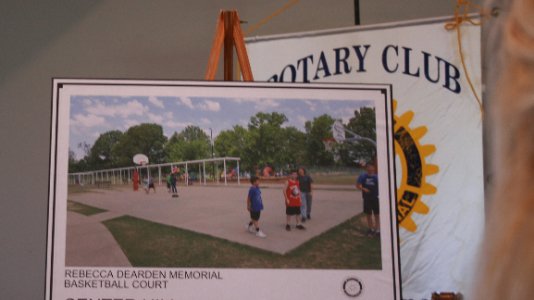 “Students will be on the mezzanine with radio-controls,” Doss said. “They will be able to look down and operate the model distribution center using STEM systems.” Doss said he feels this addition to his program will increase the number of students enrolled at CTC-East. “DeSoto County is quickly becoming one of the major distribution centers in the Southeast. The demand for a trained workforce in logistics grows daily. After we establish our model distribution center, I think this class will be an opportunity for field trips for our younger students and will introduce them to future careers in a growing market,” Doss said. 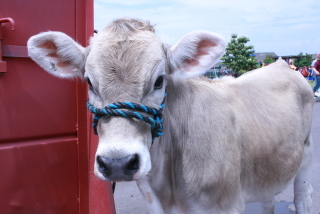 Three Desoto County School students won top awards in the Mississippi Farm Bureau Federation Agriculture Art Contest. 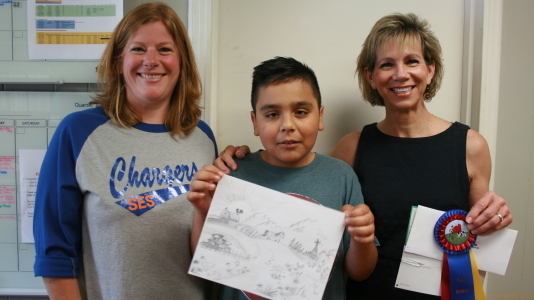 All three will have their art published in the 2019 Ag Art Calendar that is distributed statewide. 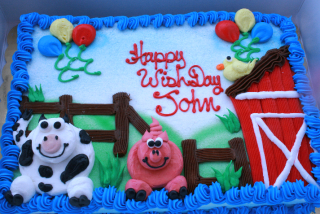 The title of the contest was called “Down on the Farm.” Farm scenes, agricultural crops and animals were the subjects of most art pieces. Mississippi Farm Bureau sponsors this contest every year to give Farm Bureau Women an opportunity to reach students in grades 1-6 and 7-12 and increase awareness of the importance of agriculture in Mississippi. Kaitlyn Hartfield at Horn Lake High was the top entry in grades 7-12, plus the overall winner for all grades. Her drawing will be featured on the cover as well as included in the calendar. She won a total of $200. 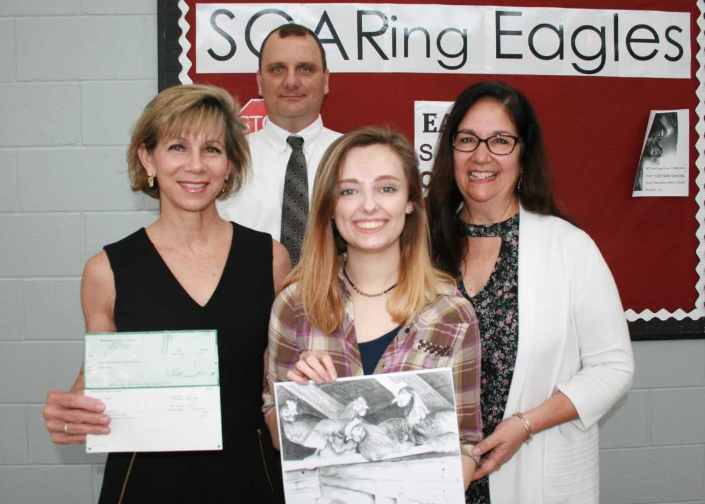 Her AP art teacher, Tammy Gill Smith, suggested using her mother’s chickens as “models.” There were hundreds of entries (391 in DeSoto County alone), and Kaitlyn's beautiful pencil drawing of nesting chickens was the Grand Award Winner,” said Dr. Sandy Slocum, MS Farm Bureau Ag Education Specialist. 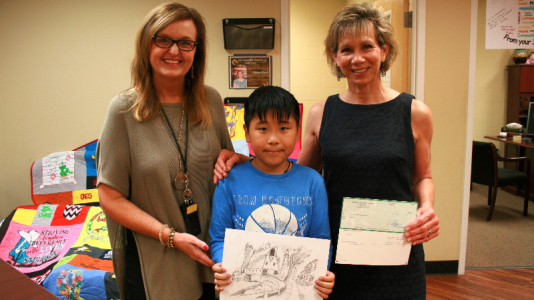 Sergio Torres from Southaven Elementary School and Anson Yan at Overpark Elementary were selected as top picks. They received $100 each and will also be published in the calendar. 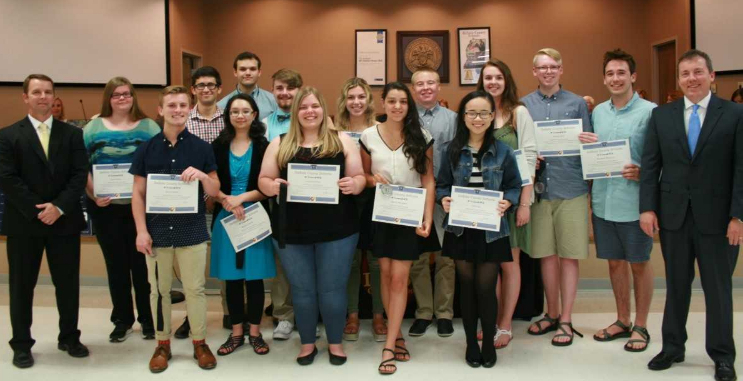 The Superintendent’s Youth Leadership Council (SYLC) fosters growth in communication skills, develops confidence, self-esteem and leadership skills, teaches financial literacy, entrepreneurship, and opens participants’ eyes to the political world. 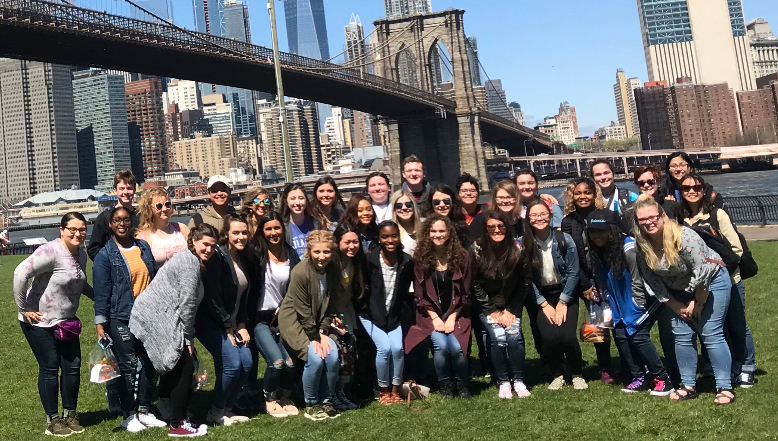 This year they studied Entrepreneurship and culminated their studies to the financial district in New York City. 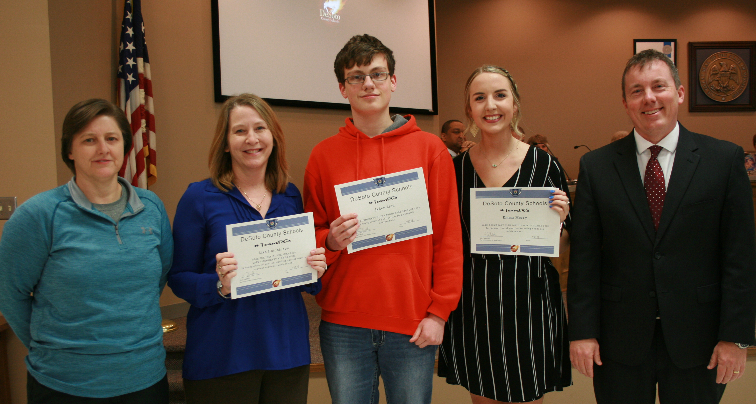 Three teams of Spotlight students in Kathryn Lander’s classes at Southaven Intermediate School won 1st, 2nd, and 3rd place in the Northern region of the Mississippi Council for Economic Education’s Stock Market Game, a program of the SIFMA Foundation. The top place team included Alex Blevins, Cameron Thomas, Gabriel Peppers and Kamarien Smith. 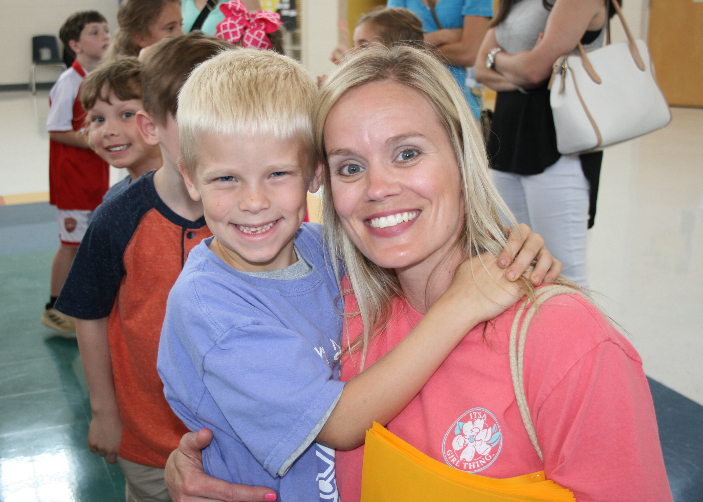 When the new school year starts, Hernando Elementary students will already know their way around Hernando Hills Elementary since they spent the day touring the second and third grade school. Three-year-old John Hobbs spent more than seven months at St. Jude Research Hospital to be treated for a rare cancer in his sinus cavity. It is called Mesenchymal Chondrosarcoma. 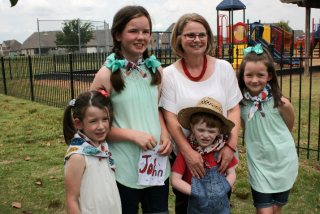 The radiation, chemo and lengthy treatment were put behind him while John, Center Hill Elementary School students and staff celebrated his recent cancer-free diagnosis with a “Make-A-Wish” event. 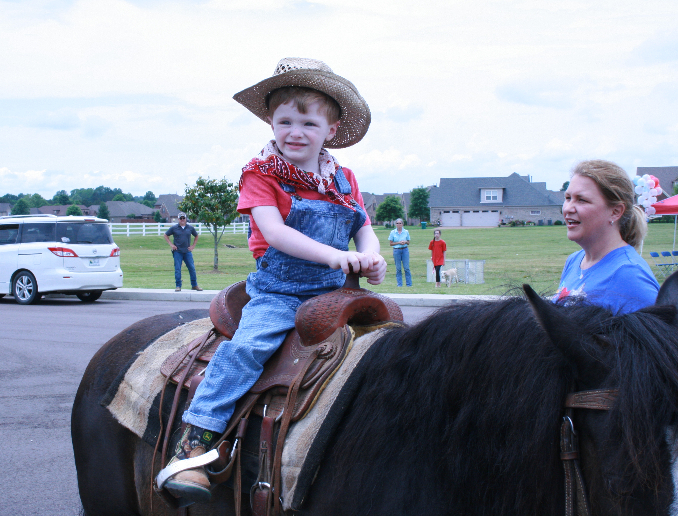 “There are no words to describe how touched we are by this generous gesture,” said John’s mother, Lyzz Hobbs. Lyzz recently graduated from Ole Miss and will teach 6th grade at Southaven Middle School in the fall. 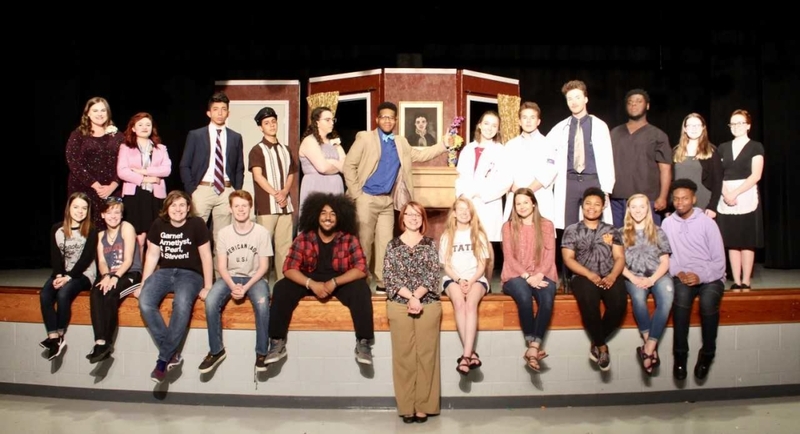 The American Theater Wing announced the Andrew Lloyd Webber Initiative Classroom Resource Grant award winners for 2017-18. 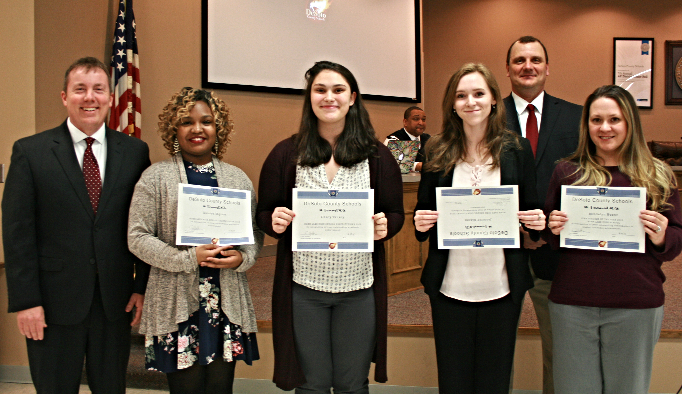 Southaven High School was one of 14 recipients out of 200 applicants. "Arts education, and making theater available to all young persons, is vital to the growth of culture and society. The grant proposals received have shown the widespread need for arts funding in primary and secondary schools across America. I am proud that we are now entering the second year of this program, and am excited for the years to come," said Andrew Lloyd Webber. With this foundation's grant program, public schools are able to receive more of the resources they need for quality drama instruction. Funding provides instruments, lighting grids and other necessary materials to help create and enhance existing theater programs. Theater teacher Cassie Cox said a new LED lighting system for Southaven High School's auditorium will be safer for students to use. Students will learn how to effectively use color in lighting design firsthand instead of in theory. "To educate is to touch lives forever." The DeSoto County School Board and Superintendent Cory Uselton celebrated 32 retirees at a special retirement breakfast sponsored by SouthGroup Insurance Services. Whether the retiree was a bus driver, a cafeteria worker, a classroom assistant, a teacher or in administration, the sentiment was the same. DCS will always hold a special place in their hearts. These adults have made an impact on the lives of students, but more often than not, students have left memorable marks on these adults. The tradition continues at DeSoto County Schools. During the last week of school, seniors put on their caps and gowns and walked through nearby elementary and middle schools. The seniors inspired younger students and had the opportunity to see teachers who helped them get where they are today. Congratulations to the Class of 2018!